Highland County Common Pleas Court Judge Rocky Coss, left, briefed county commissioners Monday on plans to establish a drug court. 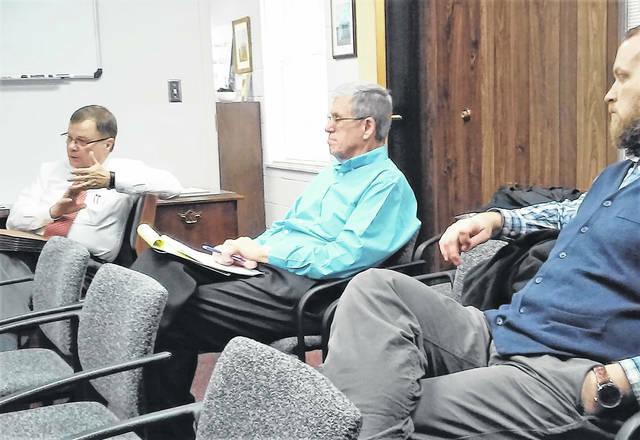 Taking note of Coss’ comments were Highland County Auditor Bill Fawley, center, and Health Commissioner Jared Warner. At the invitation of county commissioners, Highland County Common Pleas Court Judge Rocky Coss gave a status report Monday on plans to create a specialized docket known as a drug court. As previously reported in The Times-Gazette, drug courts offer defendants charged in drug crimes a second chance at cleaning up their criminal record through 18 or more months of intensive reporting requirements and treatment. The concept of the drug court has been gaining popularity statewide, he said, because of its high success rates and changes in the public’s perception of drug addiction and the crimes it can spawn. Clinton County has had a drug court for the last few years, he said, and Lawrence County just recently established one, and after meetings with several antidrug abuse organizations, he felt that the time was right to seriously begin laying the groundwork for a drug court in Highland County. Coss said he obtained the rules and policies of the Clinton County Drug Court in late 2017, and in December spoke with Lawrence County Common Pleas Court Judge Andy Ballard, seeking guidance regarding the drug court there. A key grant called SOR (State Opioid Response) has been applied for, he said, and is available to courts that aren’t yet certified, and is designed to assist them in development of a more intense approach to dealing with opioid drug offenders. Rather than trying to start an entirely new program, he said, it made sense to him to build upon what is already in place, admitting he never was a fan of “reinventing the wheel.” If there was something that was already fully functional, “don’t fix it, just expand it,” he said. He indicated the drug court would be housed with the Highland County Probation Department for processing and supervision, with defendants appearing in court every two weeks over an 18- to 24-month time period. Coss said the court will work alongside existing centers like Massie House, a men’s residential facility near Belfast, and the Lynn Goff Clinic in Greenfield, which provides residential treatment for women, in addition to the Highland County Drug Abuse Prevention Coalition and REACH for Tomorrow, a non-profit intervention organization in Greenfield. He said that delays were becoming more commonplace in getting people into area residential treatment facilities, noting that where before a bed could be secured in a few days, it is now taking weeks and sometimes more than a month. Transitioning from an offender to becoming a productive member of the community concerns him, he said, and he hopes to use some of the grant money for housing assistance, payment of reinstatement fees for driver’s licenses, or help in obtaining licenses and certifications for gainful employment. He said he would like to see the initial application and review processes completed by the end of 2019 — possibly by November — but that final approval of a certified Highland County Drug Court probably wouldn’t materialize until at least the third quarter of 2020. “This is a health care issue as much as it is a justice issue,” he said. Also Monday, County Auditor Bill Fawley advised commissioners on the requirement to create an Alternative Energy Zone for the proposed Hecate Energy Highland LLC solar power generating facility near Mowrystown. In other matters, commissioners approved a pair of line item budget transfers, and accepted a quote for a $7,300 upgrade in county email services.